Sen. John McCain, R-Ariz., a proponent of U.S. military action in Syria - and a vocal opponent of President Obama's Syrian policy - sneaked across the Syrian border and met with rebels there, CBS News has learned. The trip was in the works "for weeks, if not months," Mouaz Mustafa, the executive director of the Syrian Emergency Task Force who was with McCain all day, told CBS News' Clarissa Ward. "It's something the senator has wanted to do for quite some time because he's pro-active on the subject of the U.S. being more directly involved in Syria and helping to create the necessary changes on the ground to end the conflict." While on a trip to Turkey, McCain met with the leader of the Syrian rebels, Gen. Salem Idris, who accompanied the senator across the border at Bab Salameh and facilitated a series of meetings with assembled leaders of the Free Syrian Army. Mustafa told CBS News' Ward that McCain went to two meetings in Gazantiep, Turkey - near the Syrian border - first and met with a dozen different commanders from all over Syria. McCain then crossed Bab Salameh and met with a smaller gathering of brigade commanders near the border, Mustafa said. Idris attended all three meetings. 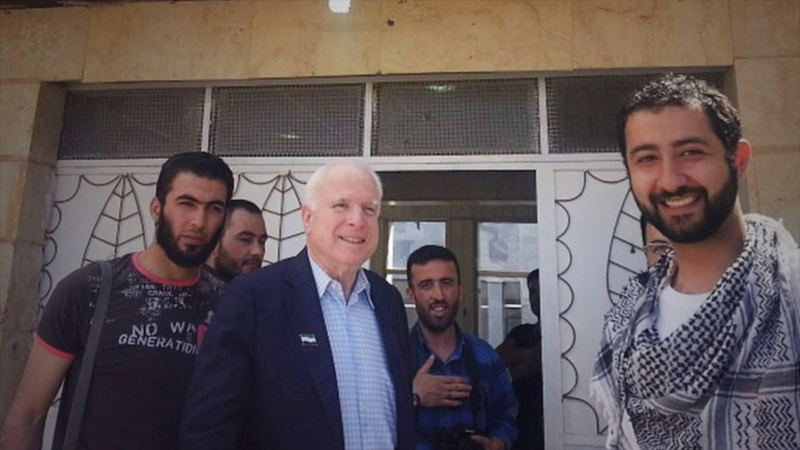 McCain, who was inside Syria for roughly an hour, had two personal security guards with him. McCain and one commander discussed Hezbollah's increasing role in Syrian fighting and also the issue of extremism, when McCain asked commanders how to best combat extremism. The commanders agreed that the best way was for them to be armed under the command of Idris. According to Mustafa, McCain said that the trip had been very important and that there was no substitute for meeting people and sitting down face to face. He said that more policymakers should make the trip inside and do the same. McCain's visit was first reported by The Daily Beast. The Daily Beast reports that during the meetings, rebel leaders called on the U.S. to increase its support to the Syrian opposition and provide them with heavy weapons, a no-fly zone, and airstrikes on the Syrian regime and Hezbollah forces. "The visit of Senator McCain to Syria is very important and very useful especially at this time," Idris told the Daily Beast. "We need American help to have change on the ground; we are now in a very critical situation." Gen. Myers on Syria: "It is a regional war"
Debate over arming Syria's rebels reaching tipping point? McCain's visit comes the same day the European Union announced it is lifting an arms embargo to Syria. It would allow member countries to send weapons if they want to, but EU officials said no decision has been made to go ahead and do so. The Obama administration is still mulling its own next steps in Syria; to date, President Obama has only committed non-lethal aid since the Syrian conflict began two years ago, despite lawmakers' calls for more forceful action from the U.S. as the civil war there intensifies and threatens neighboring countries. With the increased involvement of Hezbollah fighters from Lebanon and Iran and the potential spillover into bordering nations, former Chairman of the Joint Chiefs of Staff Gen. Richard Myers on Monday called the civil war in Syria a "regional war." "It ties Iran to the conflict ... [and], Hezbollah [is] putting its 'umph' behind the regime. It is a regional conflict already," Myers, a CBS News senior military security analyst, said on "CBS This Morning." He added that he has heard "stories about Iraqi fighters going to fight there as well," expanding the scope of the war. "If the Assad regime comes under more pressure, that certainly could spill over into Lebanon, perhaps into Jordan," he warned. Myers said it is unlikely the rebel forces can advance without arms provided by the U.S. or a coalition of Western governments. "With Hezbollah throwing in so strongly on the side of the Assad regime, the rebels are going to be disadvantaged here and probably can't make much more progress," Myers explained. The Senate Foreign Relations Committee last week passed a bill that would approve sending weapons to moderate rebels forces. The committee's chairman, Sen. Bob Menendez, D-N.J., stressed that "now is the time" to act to tip the balance toward resistance fighters. Myers said such a move "may be exactly the right thing." Myers encouraged careful "calculation of that balance between risk and reward" of providing weaponry, noting that often, "you don't know ultimately where those arms wind up." The Syrian government has committed to taking part in peace talks in Geneva next month, according to a statement from its foreign minister on Sunday. While Myers said it is unlikely that real progress will be made in Geneva given that all of the governments in attendance, except Russia, have called for Syrian President Bashar al-Assad to step down, he allowed that the talks could "be a pretty good thing" if they dampen the fighting. "McCain's trip may help to strengthen, rather than weaken, the Obama administration's interest in working with Russia on the U.N. led-peace talks scheduled for mid-June," said CBS News Foreign Affairs Analyst Pamela Falk, who is based at the United Nations. "By trying to engage the rebels, in particular the Free Syrian Army, McCain may be showing American support that the administration feels it cannot, and help bring the opposition to the table," Falk said. Meantime, Secretary of State John Kerry is in Paris Monday to meet with Russian Foreign Minister Sergey Lavrov to discuss the situation in Syria. The U.S. and its Arab allies are attempting to secure the participation of Syria's fractured opposition at next month's Geneva conference. Russia is pledging to deliver Syrian President Bashar Assad's regime to the talks. But despite claims of progress by both, there is little evidence to suggest either side is ready to halt more than two years of violence that has killed more than 70,000 people. Mr. Obama has demanded that Assad leave power; Russia has stood by its closest ally in the Arab world. The Paris meeting between Kerry and Lavrov comes at an increasingly dangerous time for Syria. For the past week, regime troops and allies from Lebanon's Hezbollah - and even some Iranian fighters - have waged an offensive in Qusair, gaining ground against the rebels behind intense bombardments of the strategic western Syria town. Hezbollah's enhanced role poses an assortment of concerns for the Obama administration, with the group's leader, Hassan Nasrallah, vowing over the weekend that his militants would back Assad to victory. Beyond providing powerful reinforcements to Assad's regime, Hezbollah's involvement increases the risk of spillover into Lebanon, a country as ethnically divided and fragile as Syria. Two rockets struck a Hezbollah stronghold in southern Beirut on Sunday, raising fears that the country could be plunged back into civil war. And any conflict with Hezbollah threatens to drag in Israel, which has proven with airstrikes it won't tolerate large-scale and advanced weapons transfers to its northern border. Lebanon's state-run news agency reported one missile fired from that area toward the Jewish state on Sunday night. For Kerry and other would-be peacemakers, the confluence of developments only reaffirms the need for a serious peace process to begin. The Americans have stressed that any talks be carried out in good faith and lead to the full transfer of power to an interim government. Logic, they say, compels that this government not include Assad or other members of his government culpable in widespread abuses.